Pool Academy’s school librarian swopped her books for a beard when she took part in a charity Santa run. Sandra Hampton took part in the event in Truro over the weekend to raise much-needed cash for Cornwall Hospice Care. 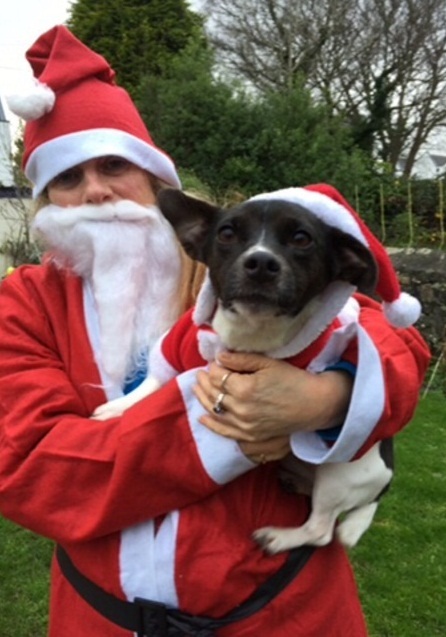 She and her dog were given a special Father Christmas outfit to wear whilst completing the 3km route around the city centre. About 150 people took part and Sandra said she managed to raise more than £30 for the cause. She said the charity was an important one because it helped those suffering from cancer and other life limiting illnesses. Sandra said she enjoyed it so much she may even do another this year in a different town. She is still collecting sponsorship for the charity. “I love dressing up and it was a lovely and relaxed atmosphere,” she said. “It was a really nice event with families, little children and people with their dogs. “We meet at the Methodist church and did a few warm up exercises to music before we set off. “When we got back we were given a medal, a bottle of water and a pasty. “It went really well and the weather was quite mild.